An internationally recognized soloist, Anaïs Gaudemard quickly stood out in the musical world among the best current harpists and brilliant musicians of the new generation. First Prize and Special award for the best interpretation of The Crown of Ariane by Murray Schafer at the prestigious International Harp Contest in Israel 2012, 2nd Prize and the Münchener Kammerorchester Prize at the ARD Munich Competition 2016, Anaïs stands out again by becoming« ECHO Rising Star » 2018/19 season hand-picked by the directors of the most important concert halls in Europe. She will perform in venues such as the Wiener Konzerthaus, Elbphilharmonie Hamburg, Kölner Philharmonie, Barbican London, Festspielhaus Baden-Baden and Amsterdam’s Concertgebouw among others. Anaïs Gaudemard is also this season "Associate Artist" of the Orchestre Symphonique de Mulhouse in France. In 2015, Anaïs wins the « Thierry Scherz Prize » at the Festival des Sommets Musicaux in Gstaad. This prize awarded by the Foundation Pro Scientia & Arte offers her the opportunity to record her first CD with orchestra. Anaïs has chosen to dedicate it to Debussy, Boieldieu and Ginastera Harp concertos with the Orchestre de l’Opéra de Rouen Normandie released in November 2016 for Claves Records. This recording has been warmly welcomed by the press and has been nominated at the ICMA (International Classical Music Awards) 2017. 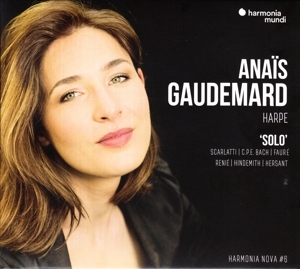 In February 2019, her new album "Solo" dedicated to works by Scarlatti, Bach, Fauré, Renié, Hindemith, Hersant is released for Harmonia Mundi. Anaïs Gaudemard had the privilege to collaborate with orchestras such as the Lucerne Festival Orchestra, Münchener Kammerorchester, Symphonie-Orchester Des Bayerischen Rundfunks, Israel Philharmonic Orchestra, Israel Symphony Orchestra, Collegium Musicum Basel, WKO Heilbronn, Hong Kong Sinfonietta, Orchestre de Chambre de Lausanne, Orchestre Philharmonique de Strasbourg, l’Orchestre de l’Opéra de Rouen Normandie; under the direction of Claudio Abbado, Leonard Slatkin, Kazushi Ono, Mariss Jansons, Nir Kabaretti, Leo Hussain, Emmanuel Krivine, Constantin Trinks, So Perry, Kevin Griffiths,Wen-Pin Chien, Jamie Phillips. Anaïs Gaudemard studied at the CNSMD in Lyon, France (First prize unanimously awarded with the congratulations of the jury in 2013) then she continued her studies at the HEMU in Lausanne where she obtained the Master of Arts specialized « Soloist » with the highest honors and the First Jost Prize which recognizes the best performance of a concerto in 2015. Since 2014, she is laureate of the Fondation d’Entreprise Banque Populaire which grants her an award to pursue this commitment in creation and the command of works for the harp. Anaïs plays on a Style 23 Gold Concert Grand harp, offered by the harp maker Lyon and Healy, Chicago at the 18th International Contest in Israel.